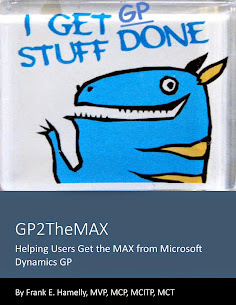 The powers-that-be at Microsoft were gracious enough to include me for another year with the best of the best GP folks. Congratulations to fellow 2009 MVPs Andrew Karasev, Charles Allen, David Patrick, Leslie Vail, Mark Polino, Mariano Gomez, Mohammad Daoud, Monzer Osama, and Victoria Yudin. Here's looking forward to another fun and interesting year in GP-land! Many Congrats to you on your MVP again. Great work. Thanks so much Janakiram. I fully expect you to part of the gang soon!